It was a Friday morning in July, and Guadalupe, Maria, and Dawn were at Wild Cat Creek in north Richmond, California, clipping and tearing invasive ivy out by its roots. They were obsessed with making sure every cottonwood tree thrived and had the chance to reach its fullest potential. A few yards down there was a cottonwood tree covered with ivy all the way up to its highest branches. We couldn’t help that tree, it was doomed. But for the rest, there was still hope and even though we planned to leave at noon, I could not persuade the ladies to leave the patch of ivy they were clearing out; here was one thing they could do to make a difference, to save a life. I had seen their collective determination many times: It is connected to their determination to save their families, their children and grandchildren, their community. North Richmond, where I work, is also known as “North.” It’s a place with more cement than trees, with rundown homes and vacant lots full of trash. It is the poorest area of Richmond, which is already considered a very poor town in the San Francisco Bay Area. During and after World War II it was the one place that black people could afford to buy a home; most of the families had their own gardens and grew their own food. It was known for its blues and jazz clubs, and soul food restaurants. It had culture, food, and a sense of calmness—but it doesn’t have those things anymore. Like the ivy the ladies were killing, poverty and neglect have taken on a life of their own here in North. The Navigators exploring Wildcat Creek. 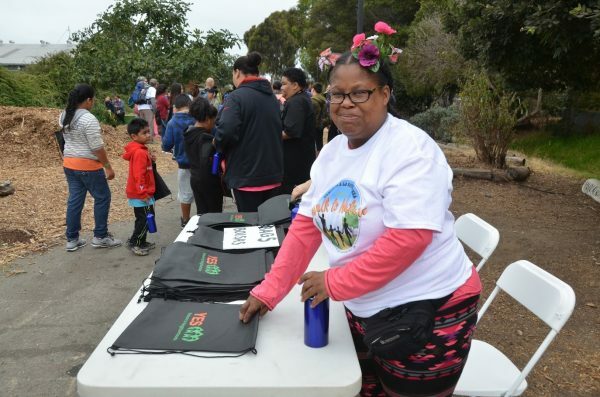 Guadalupe, Maria, and Dawn are Wellness Navigators with YES Nature to Neighborhoods, a non-profit in Richmond that provides camp programs, year-round wellness programs, and nature outings. 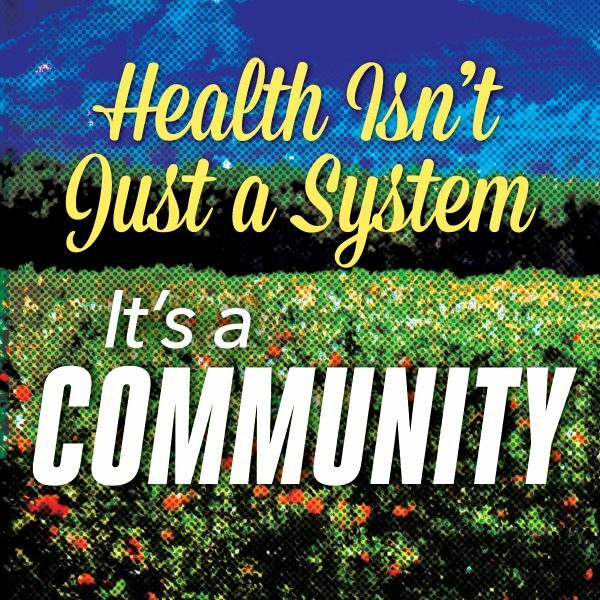 I coordinate the 15 Wellness Navigators, who come together weekly to support each other in living healthily and to promote health and awareness in the greater Richmond Community. 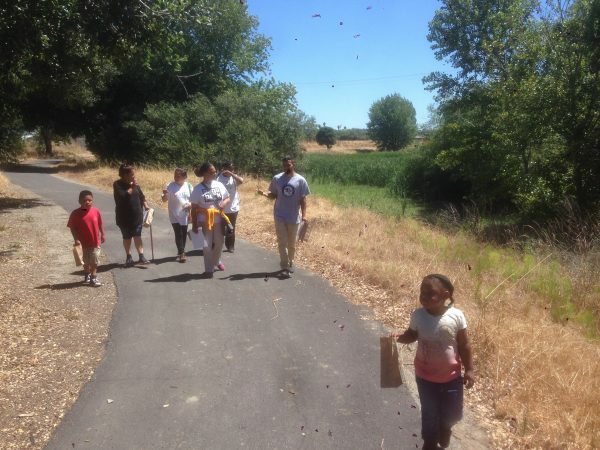 In the summer, we work closely with the Richmond-based Urban Tilth, a non-profit that supports school and community gardens and urban creek restoration. Sometimes it’s hard to keep clearing away the violence, disease, polluted air, and poor education, to find hope. Many people only hear, see, and know about all of the ugliness that North Richmond is known for, but there is always something more. When I got to know this community of grandparents, parents, and children, I came to see the neighborhood as strong and resilient, deep, and beautiful. To me North Richmond is like the bittersweet lyrics of a Billie Holiday song. That Friday was a quiet, beautiful, sunny day. Everything was green and there were butterflies. We had all met with Urban Tilth staff members Nathan and Princess. Nathan is a naturalist and the manager of the watershed restoration program. Princess is a North Richmond resident and is the community coordinator for the North Richmond Farm Project. And when we arrived at the creek, they gave us a full tour and created a scavenger hunt, teaching us how to identify the native plants that grow at the Creek, and how to identify and remove the invasives, like the ivy. The children were eating the blackberries and their moms were harvesting bay leaves. It was a carefree day for people whose lives have been full of cares. Guadalupe is a mom of six who is an excellent cook and gardener: Every square inch of her front and back yard is full of flowers, plants, and vegetables. She has overcome an abusive relationship with her former husband, but she often shuts herself away for days at a time not able to always manage the residue of that trauma. Maria has raised two sons and is now raising two grandchildren. She has diabetes and uses a cane, but she walks at least two miles every day. She has overcome severe depression and shares her story all the time. Dawn lives in Central Richmond about one mile away, and when I first met her three years ago, she made sure to let me know she would never come to “North” because her two nephews were killed there in a gang warfare attack. 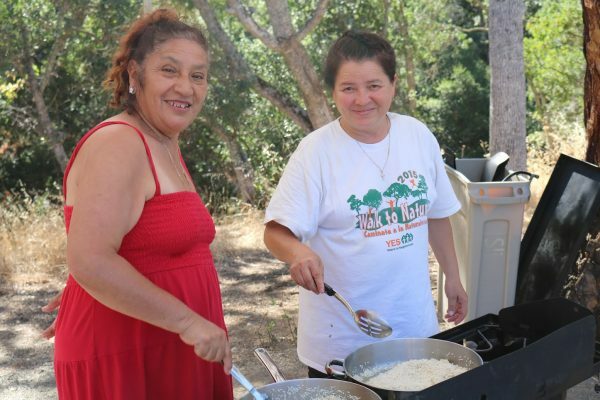 Navigators Maria and Guadalupe cooking outdoors. I knew Dawn loved being in nature more than anything, and when I asked her to come with us that Friday she said yes. I didn’t ask her why she changed her mind. I would like to think that in the past three years all of the support, comfort, and encouragement she had received from the other Navigators, many from North, had brought her healing. We stopped working to eat a snack I had brought when we heard the sound: Pop! Pop! Pop! Was it fireworks or gun fire? Where was it coming from? Should we duck and cover? No it was not near us. We were OK! But were we? In that moment we pulled back from our gardening to think about our circumstances. We could see the Chevron refinery was still puffing away, and yes, we agreed, those were gun shots we’d just heard. But look around us! There was a homeless encampment hidden behind the blackberry bushes, and the liquor store down the street was full of loiterers. Was it all too much? Were we doomed like the cottonwood tree that we could not help? Fast forward to the following Friday. 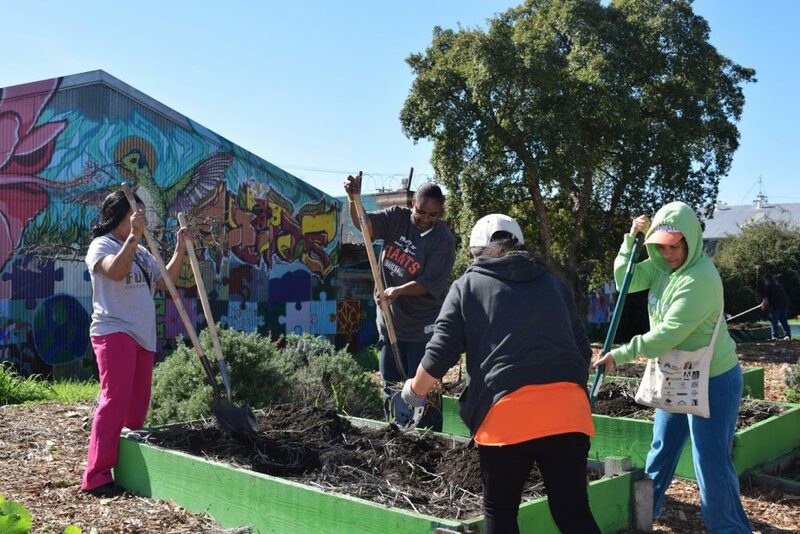 We were in North Richmond again at Urban Tilth’s garden at First and Market. The garden manager Tania Pulido gave us a tour and put us to work planting medicinal herbs. We planted yarrow, chamomile, mint, echinacea, and feverfew. A little girl named Samaj was happy that she got to water the plants. She sprinkled everything including us and herself; no one minded. We ate mint, and fennel, strawberries, and peaches. The adult navigators worked together with youth and children; people from Central had come to North. But there was something deeper happening than merely planting herbs. The planting was what was deep in our hearts. It was a promise: A promise of a future, a future full of hope and dreams that could become realities for the neighborhood, our families, and ourselves. Fresh produce in the community is one promise that is being fulfilled. And soon there will be trees planted on the corners. *Lead photo: Navigators working in North Richmond. Semaj is the one in pink pants. All photos courtesy of Tana Montiero.